Savvy homeowners understand that the fall and winter months are the perfect time to plan their deck building project. 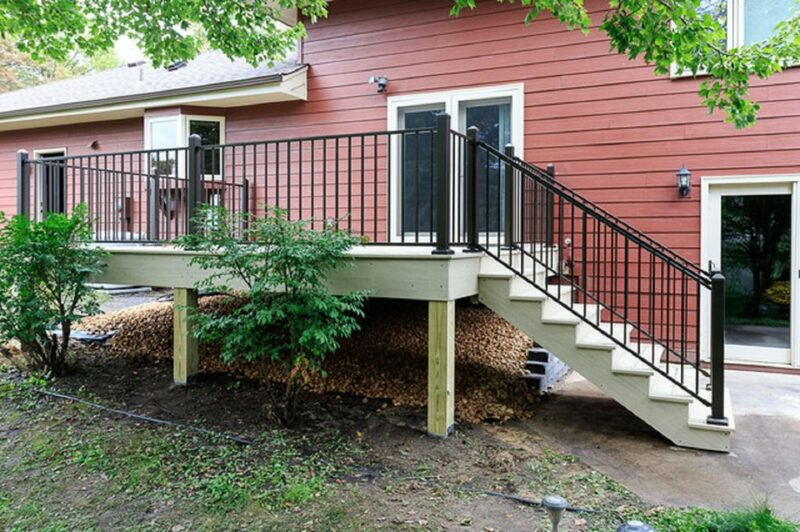 After taking the time to research Twin Cities deck builders, Joy in Blaine, MN reached out to us for an estimate so that the project could be completed the following year. 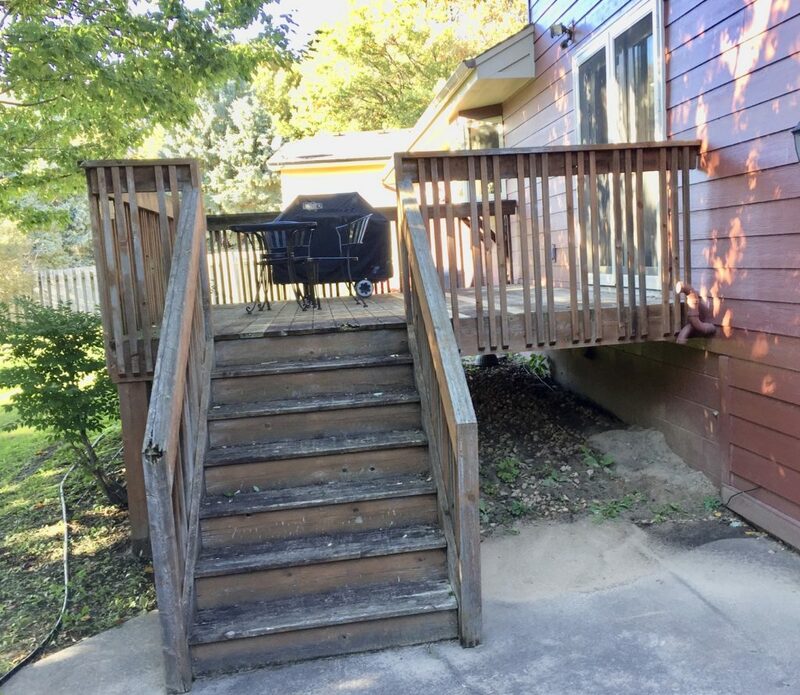 When asked to describe the status of her home’s preexisting wood deck, she used the word “decrepit”. Though once a point of pride, the stairs, flooring, and railing had become discolored and showed signs of decay. The stain had worn off in multiple areas. Uninterested in ever staining her deck again, she wanted more information about the maintenance-free options available. Here’s why AZEK® composite decking with a Fortress™ steel railing proved to be a winning combination. Aesthetics: It’s difficult to feel enthusiastic about entertaining guests when your deck shows such strong evidence of weathering. The stain that had been used on the wooden deck blended into the home’s red siding. In order to add contrast and better blend in with the home’s window wraps, roofing, and gutters, we utilized decking from AZEK®’s Arbor Collection. This collection wins favor with homeowners because it imitates the pleasant, vivacious hues of exotic woods. The color Joy selected was Hazelwood. The muted, modern light shade of brown is characterized with various markings in an array of colors. The Antique Bronze Fortress™ steel railing provided a dark and dignified look to the project. Warranties & Durability: One of the most frustrating aspects of owning a wooden deck is the frequent staining it requires. Homeowners that install AZEK® experience peace of mind because the deck is accompanied with an industry-leading 30-year limited fade, stain, and limited lifetime warranty. This alleviates the concern of splintering and discoloration. In addition, all projects completed by our team at Lindus Construction come with a Lifetime Workmanship Guarantee. Fortress™ Railing Products are covered with several layers of anti-corrosion protection to ensure the finish stays intact for the life of the system. Lastly, it’s our pledge that if any of the products we install fail due to improper installation, we’ll correct this situation at no cost to the homeowner. When it came time to replace their rotting wooden deck, this Minnesota couple opted to have us install Zuri® Premium Decking by Royal®. "I've been using Lindus Construction for many years, because EVERYTHING they do, they do well. They have put on gutters, a new roof, siding, windows, doors, a new deck, and even drain tiles. Everything is done perfectly. I've tried many contractors in the past. None even come close to Lindus." - Dan O. "My husband and I had our gutters and downspouts replaced with LeafGuard® after years of repeatedly cleaning debris from the old standard gutters. I think we tried almost every product before we admired these close up. I cannot imagine a better nor higher quality job. I absolutely love them. They are worth every cent and I'm still excited about them." - Diane T.
"Excellent work. The end result was very nice." - Clydia B. "Performed on schedule and professionally. Materials used were excellent and better than the contractors who repaired my neighbors' roofs due to the same storm." - James W.
"Excellent contractor that has ethics and performs its work in a professional manner and goes beyond the minimums necessary to do the work. Their design of doing the work is done in a way that allows long term guarantee of the materials and work." - Jim W.